Showing 41 articles from September 23, 2015. LOUISBURG -- A judge declared the proceedings against a Zebulon man accused of killing his ex-girlfriend in Franklinton as exceptional -- a designation that streamlines a case that could include murder charges against the suspect in Johnston and Wake counties. Authorities arrested Garry Yarborough on July 27, a day after they allege he shot and killed Tracy Williams in a grocery store parking lot off U.S. 1. Yarborough, 35, has been charged with first degree murder, first degree kidnapping breaking and entering, assault with a deadly weapon with intent to kill, and felony burning personal property. It's officially fall and the weather forecast is already calling for much cooler daytime highs and downright chilly nights for the next few days, not exactly surprising since October is just a week away. 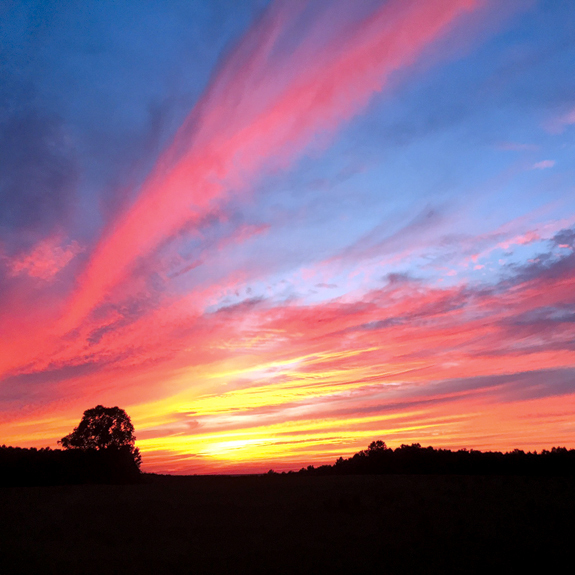 But while summer has officially ended, it went out in spectacular fashion with some of those sunsets that are bedazzling. This photo was taken by Franklin Times sportswriter Geoff Neville in the Mapleville community recently, a fitting tribute to the change of seasons. 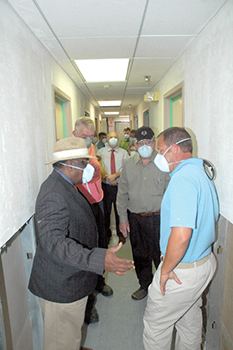 LOUISBURG -- The Franklin County Board of Commissioners agreed to spend more than $336,000 in two no-bid contracts to clean up its health and human services building after touring the moldy building Tuesday. The health department side of the building was shut down to staff and clients for about a week last month after tests revealed dangerous levels of mold in certain parts of the building on Industrial Drive. 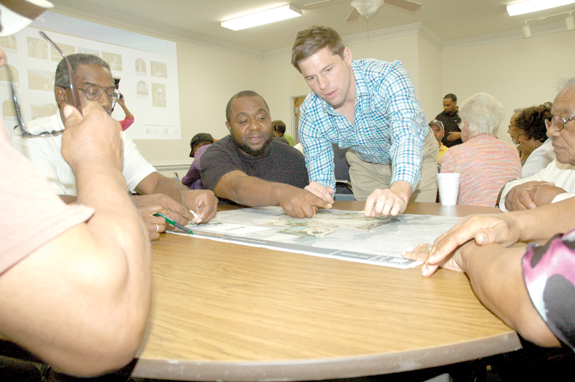 LOUISBURG -- About 50 people filled a clubhouse Tuesday night at the site of the county's newest park, spitballing ideas to develop the site. In early 2010, local businessman Edgar Owens left the county, through his will, nearly $1 million to develop a park -- asking only that it be named after his parents and if money was available, build a pond stocked with fish. The county bought the Bull Creek Golf and Country Club site last summer to turn it into a county park. 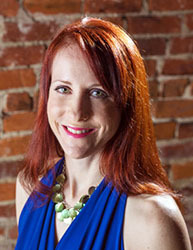 They've also hired the John R. McAdams Company to develop a master plan for the site. 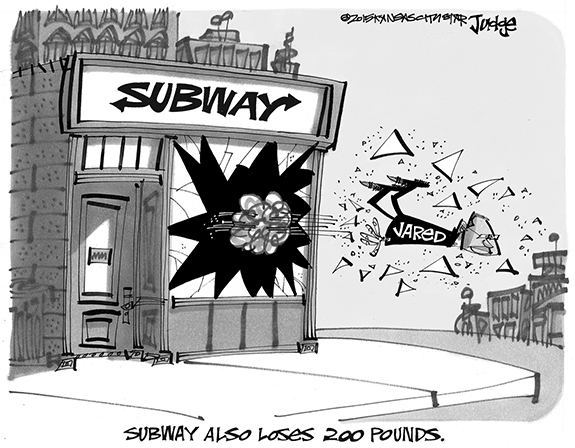 FED's inaction understandable, but not a good sign! Wasn't it fascinating last week listening to Janet Yellin and the FED frantically explain why they didn't raise interest rates? Gee, why all the fuss? The world's economy is in shambles, the U.S. Stock Market is bouncing all over the place while ending mostly lower and the economy is balanced on a knife edge over a precipice. Here are some basic numbers that will leave you either numb or enraged! 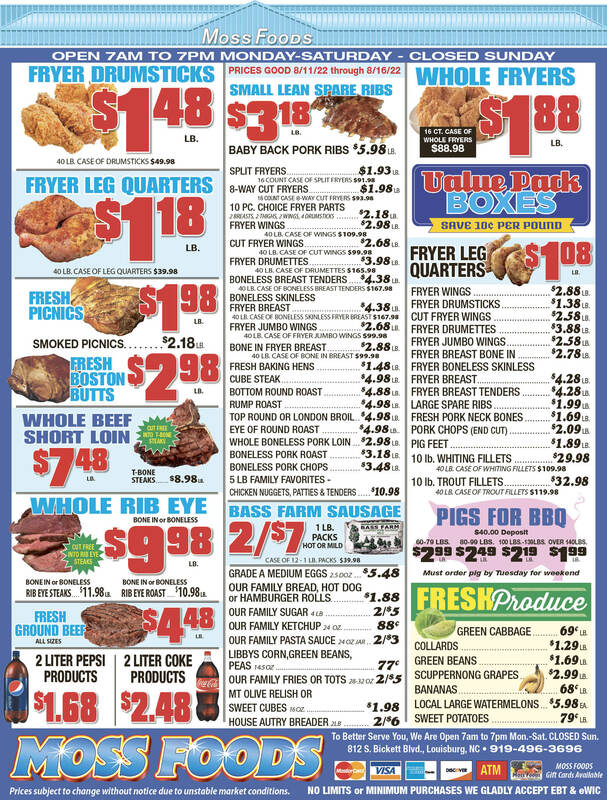 1) From $13.50 to $750 overnight. 2) More than 50, with exactly the same results. In a few weeks, the zombie apocalypse will continue with season 6 of AMC's The Walking Dead. However, anyone who's been paying attention will tell you that zombies have been around for some time now. You can see them anywhere you look. They're either walking around aimlessly, arm outstretched, head bent down, staring at their cell phone. With only hours to spare before the third extension expired, Gov. Pat McCrory signed the budget into law. This boondoggle (it's a family newspaper) was originally due on July 1. The budget is the only thing the Republican controlled General Assembly is required to do and they were almost three months late. Between now and Election Day 2016, I'm sure McCrory, who is fighting for his political life, will lead the Republicans all over North Carolina bragging about how they cut taxes. Many people might have been amused or entertained by the latest Republican Presidential Debate. I am not. I am angry and frightened. The so-called "A Team" by Mike Huckabee, really? 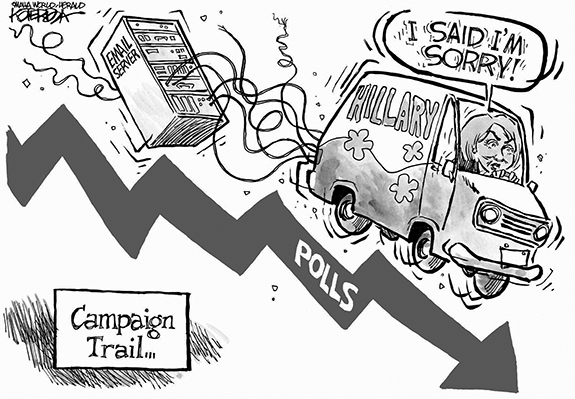 Peel back the boasting, insults, lies and exaggerations common to any presidential campaign and what is left? Mostly a collection of assertions so untrue and bizarre as to be surreal. LOUISBURG - Bettie Jean Morris, 67, of Louisburg passed away peacefully on Tuesday, September 22, 2015 with her family and friends by her side after a courageous fight with cancer. Bettie was born February 11, 1948 in Hastings, MI to the late Richard and Ruth Shellenbarger. In addition to her parents and husband, Jerry, she was preceded in death by her sister, Susan Twigg. LOUISBURG - Maylon Dock Cash, 82, died Wednesday, Sept. 16, 2015. 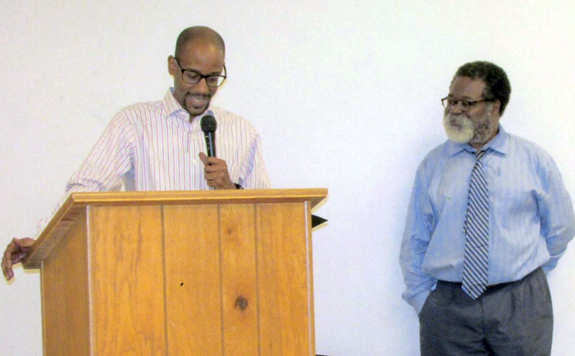 Funeral services were held Friday afternoon, Sept. 18, in the chapel of Bright Funeral Home. Burial was in Flat Rock Baptist Church cemetery. ZEBULON - William Francis England Jr., 68, died Monday, Sept. 21, 2015. 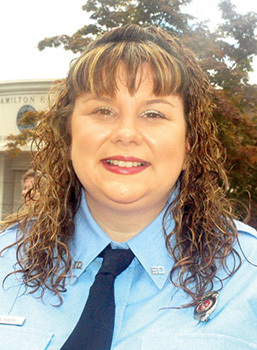 A memorial service will be held at 7 p.m. Friday, Sept. 25, at Massey Funeral Home, Zebulon. FULL EXTENSION. Louisburg's Amonte Moses (with ball) tries to avoid a lunging tackle attempt by Bunn's Ian Land during last Friday night's prep football contest. The host Wildcats earned a 62-6 victory over LHS. 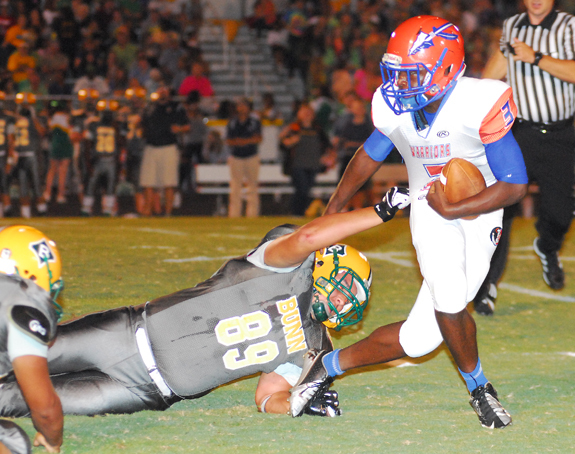 In a matchup between two clubs at differing program stages, an experienced Bunn squad had no trouble defeating the young, rebuilding Warriors by a 62-6 margin last Friday night at the BHS Football Field. DARRON GETS THE JOB DONE. 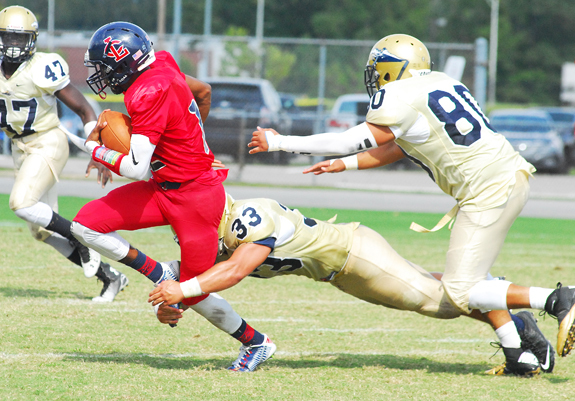 Louisburg College's Darron Downing (with ball) escapes the North Carolina Wesleyan College JV defense during Sunday afternoon's football matchup in Rocky Mount. ROCKY MOUNT -- Louisburg College's football game plan was right up the pound-it-out alley of its head coach, who was an old-school lineman at the University of Washington. Certainly, LC's strategy drew accolades and endorsements from Coach Trevor Highfield -- even though he concentrates more on the defensive side of the ball these days. TRIPPED UP. 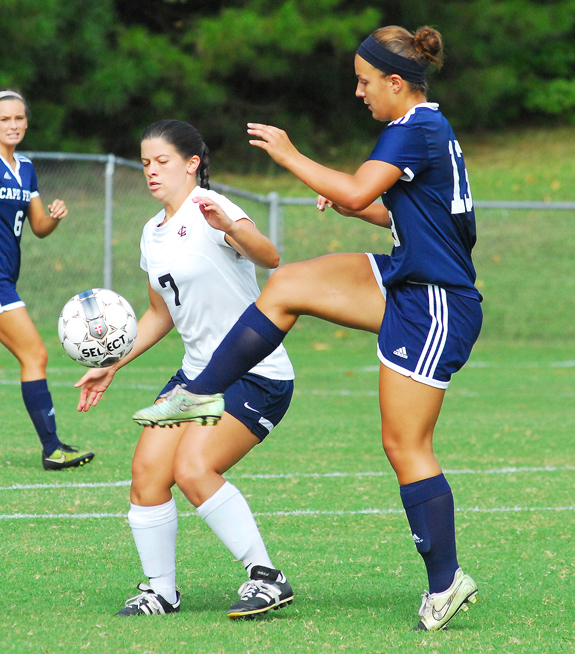 Cape Fear's Raime Cooper (left) loses her footing during Tuesday's Region X women's soccer matchup at Louisburg College. LOUISBURG -- Three hasn't been a crowd over the past decade in the Region X women's soccer scene, as the same trio of clubs -- Louisburg, Cape Fear and Spartanburg Methodist -- have controlled the upper portion of the standings. Halfway through this fall's league schedule, the trend has continued with Cape Fear in first place -- and Louisburg and Spartanburg not far behind. 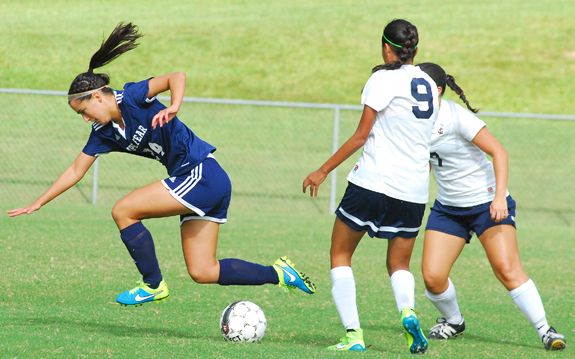 Tuesday's meeting between host LC and Cape Fear was contested with first place on the line, and the Sea Devils used a second-half penalty kick to defeat the Lady Hurricanes by a 1-0 margin at Ronald May Field. 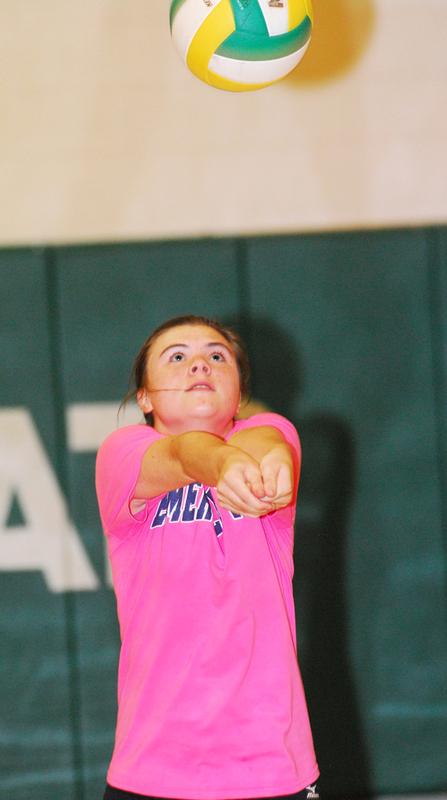 BUNN -- Following a devastating home loss to rival Louisburg two weeks ago, it was unsure how anyone associated with the Bunn High School volleyball program would respond. That list would include veteran skipper Henry Jones, who has been with the Ladycats for over two decades. FORWARD THINKERS. (L to R) A North Carolina School of Science and Math player and Franklinton's Andres Sanchez-Urias joust for possession during Monday's soccer match. 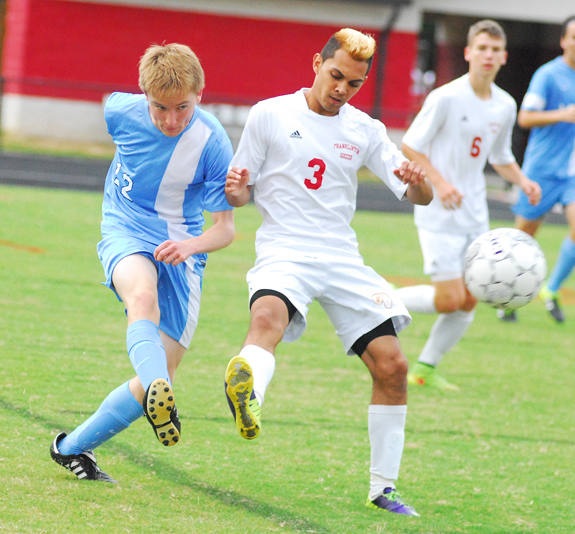 FRANKLINTON -- Over the past week, the Franklinton Red Rams have been in the thick of the topsy-turvy world that is the Northern Carolina Conference boys soccer standings. Last Wednesday, Franklinton tied 2-2 with Bunn at hope in a contest featuring two clubs that expect to make a run toward spots in the Class 2-A State Playoffs. 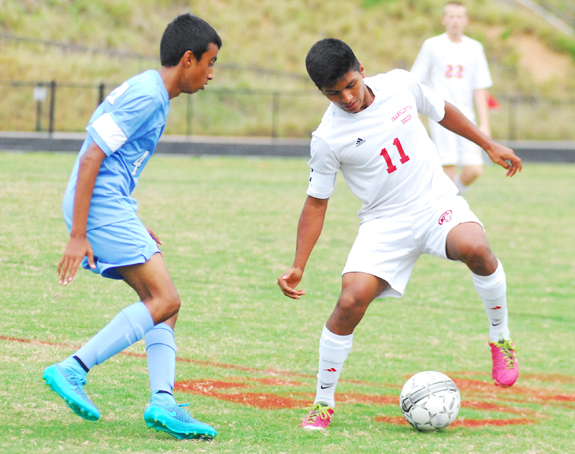 FHS led 2-1 in overtime thanks to a goal from Andreas Ortiz, but Bunn's Brian Reyes would even things up for good with a tally in the second portion of overtime. ZEBULON -- It was announced recently that 2015 Carolina Mudcats' players Johan Camargo, Joseph Odom, Connor Lien, Lucas Sims, Andrew Thurman and Mauricio Cabrera were chosen as six of the seven Atlanta Braves prospects to play in the upcoming Arizona Fall League beginning on October 13. All six players began the 2015 season with the Mudcats; Camargo, Odom and Lien each finished the year with Carolina in Zebulon. YET ANOTHER BOLTON BLAST. Louisburg's Whitney Bolton (right) goes up for a kill during last Wednesday evening's home volleyball victory against the Franklinton Lady Rams. LOUISBURG -- Of the many intangibles Louisburg High School's volleyball team has displayed this season, resiliency has to be at the top of the list. Louisburg has shown savvy in picking up several clutch victories in 2015, including its miraculous comeback win two weeks ago at Bunn. 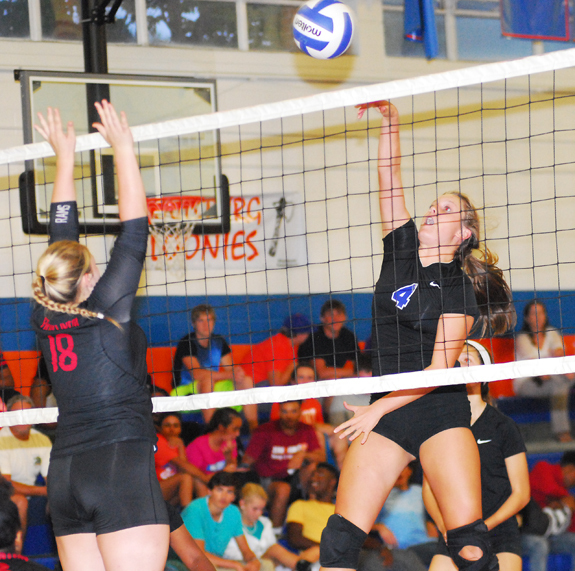 The Lady Warriors were at it again last Wednesday against another solid county rival -- Franklinton at home. The energetic, young Lady Rams were on the cusp of gaining the first set, only to see Louisburg claw back for the victory. HENDERSON -- The Kerr-Vance Academy Spartan varsity boys soccer team defeated Grace Christian of Sanford 5-1 last Thursday evening. The Spartans got on the board early when Joseph Burnette scored on an assist from Drew Griggs just 12 minutes into the match. The Spartans controlled possession for most of the half limiting Grace Christian to only a few scorning chances. Grace had its best chance when the Spartans had an inadvertent handball in the box in front of their own goal. Cooley is a Bunn native who was a basketball star for the Wildcats. He went on to become a successful coach and athletic director at Wakefield High School. Cooley is currently battling colon cancer, and proceeds from the event will help pay his medical bills. Cost is $400 per foursome, which includes lunch, green fees, cart and prize opportunities. 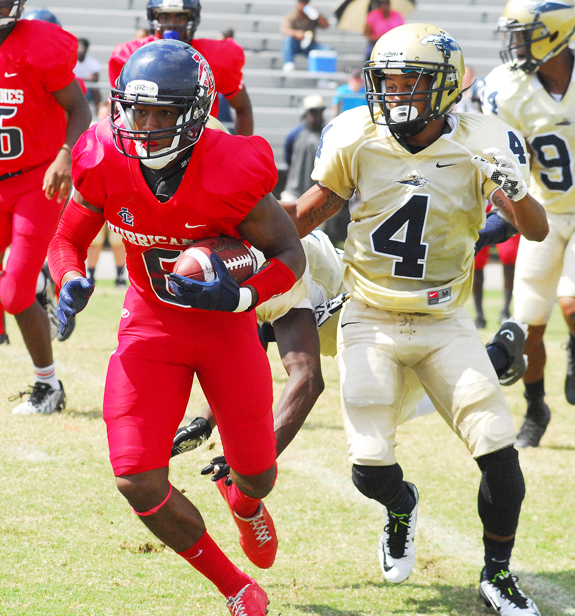 ELON -- A fourth-quarter touchdown run by former Bunn standout Tarik Cohen broke a 7-7 tie and lifted the North Carolina A&T Aggies to a 14-7 victory over the homestanding Elon Phoenix in front of 9,729 fans at Rhodes Stadium last Saturday night. Entering the fourth quarter, Elon (1-2) trailed the visiting Aggies (2-1) by a 7-0 margin. Conner Christiansen then guided the Phoenix on an 80-yard drive that took just 1:36 to knot the score at seven. Louisburg College's Anna Capps (left) converges on a ball during Tuesday's home soccer loss against region rival Cape Fear CC. 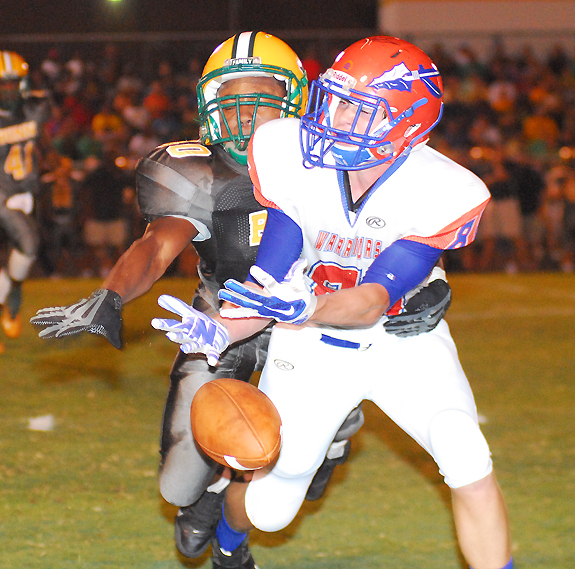 Louisburg's Max Jones (right) tries to come up with a pass reception while being defended by Bunn's Victor Dunston during last Friday night's football showdown. Sam Mobley (with ball) streaks upfield for Louisburg College during Sunday's road victory against the North Carolina Wesleyan College Junior Varsity Team in Rocky Mount. 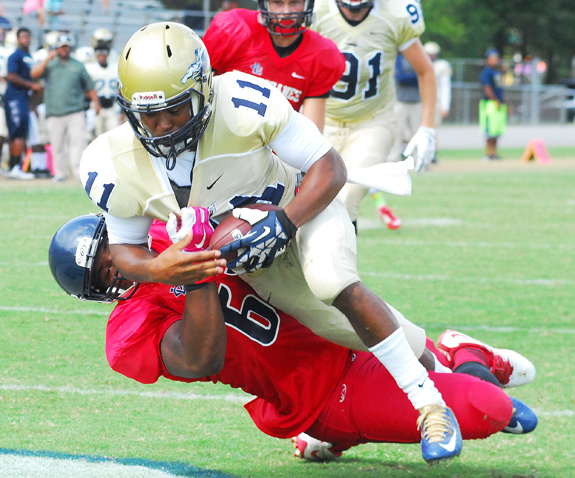 On this play, Louisburg College's Larrell Murchinson sacked North Carolina Wesleyan quarterback Trey Jackson in the end zone for a safety in the second period of Sunday's college football matchup at Bishop Stadium in Rocky Mount. Franklinton's Ruben Santiago (right) advances the ball for the Red Rams during Monday's league soccer event against the North Carolina School of Science and Math Unicorns. 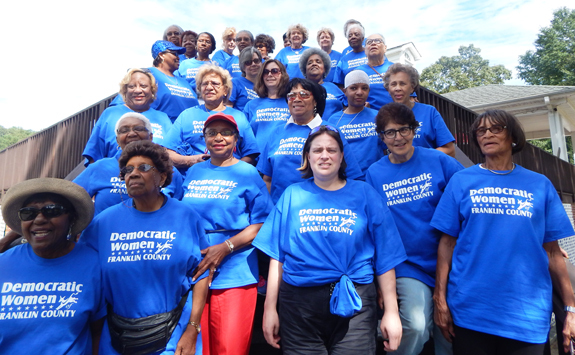 The Democratic Women of Franklin County (pictured above) held their annual Golf Tournament on Sept. 16 at The River Golf Course. Over 70 teams took part in the event. Franklin County Arts Council Photographers Guild will premier its third annual photography show Thursday, Oct. 1, in conjunction with the Franklinton Art Stroll. The photos will be displayed in the front gallery at Franklin County Arts Council headquarters, 22 S. Main Street in downtown Franklinton. The public is invited to attend between 5:30 and 7:30 to view the show and enjoy refreshments with the photographers. They will also have the opportunity to vote for their favorite entry in the People's Choice Award. High school student Brandy Babbitt receives a certificate from Franklin County Board of Education chairman Gil Johnson (left) during a recent school board meeting. Looking on are her aunt, Charlotte Moss, and Superintendent Dr. Pascal Mubenga. Babbitt is a senior at Bunn High School and is the first student from Franklin County to be accepted into the North Carolina Triangle Apprenticeship Program, or NCTAP. As part of the program that's valued at more than $140,000, Babbitt has been hired by Youngsville Manufacturer CaptiveAire, and has already begun working there part-time. 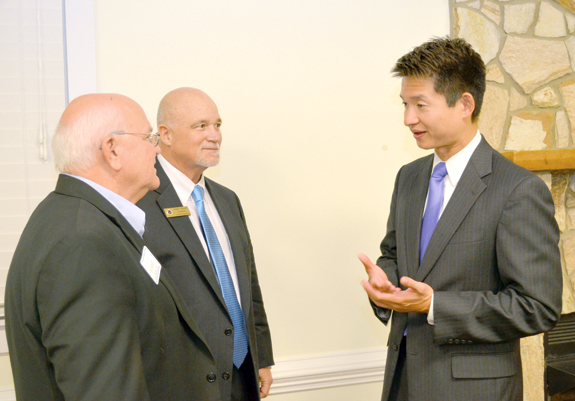 YOUNGSVILLE -- If Franklin County is going to prosper, it will need an infusion of cash coming from those outside its borders, said the new leader of a statewide initiative to attract and retain business in North Carolina. And, if the Economic Development Partnership of North Carolina (EDPNC) is to be a resource, Franklin County has to have the resources it can sell to prospective business and industry. LOUISBURG -- The Louisburg Town Council waded through a series of utility system improvement projects Monday night, agreed to seek a grant to study public transit in town and delayed for further study a proposal that would have changed the town's sign ordinance to allow larger signs in some areas. Among the utility projects was seeking a $255,000 federal grant to replace an aging, galvanized water line that services Bullock Drive and the Louisburg Elderly Apartments. Safe Space is sponsoring a March Against Domestic Violence and Sexual Assault on Thursday, Oct. 1. This is a kickoff event, recognizing October as National Domestic Awareness Month. Participants will gather at South Main Street Baptist Church, 805 S. Main St. in Louisburg at 10:15 a.m. The march begins at 10:30 a.m. and will end at the South Main Street bridge in Louisburg. Wear your purple or your Memorial Tee's. George Raymond Manley retired on Aug. 30 after 30 years of service with the Department of Corrections. He served as a probation and parole officer in Franklin and Vance counties. His family and friends gathered at the Louisburg Operations Center on Saturday, Sept. 12, at 5 p.m. for a celebration dinner. George Thurston Manley served as the master of ceremonies. He kept the audience laughing by telling funny stories about his father. 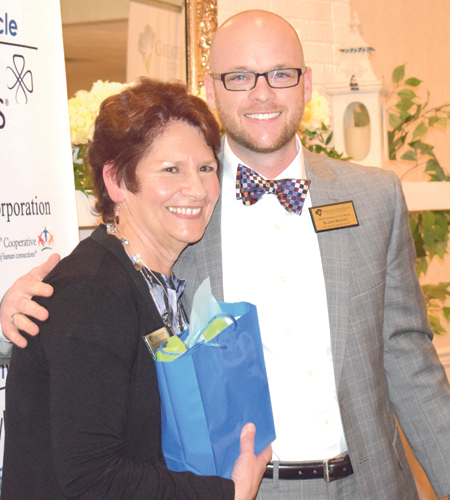 Geraldine Manley welcomed everyone to her husband's celebration. The high school sweethearts have been married for 39 years. The Franklin County Tobacco Research Referendum will be held on Thursday, Nov. 19. Charles Mitchell, county extension director, said the polling location will be at the Franklin County Agricultural Services Center in Louisburg, 103 South Bickett Blvd., from 8 a.m. until 5 p.m. The tobacco referendum is being held to let tobacco growers decide if they wish to continue the self-assessment program. This program has been in place since 1991, and the law requires that a new referendum be held every six years. 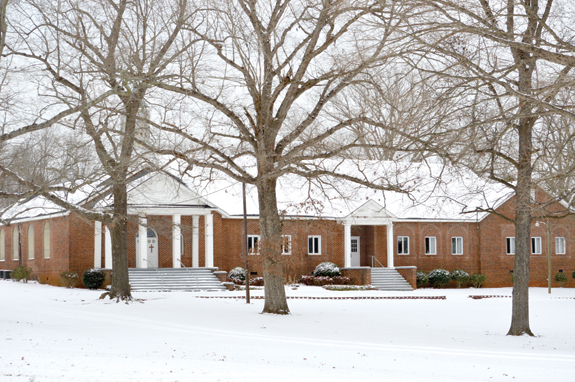 Wood Baptist Church: 'Slice of heaven' for 100 years! A couple of miles east of Centerville, in the far northeast corner of Franklin County, lies the community of Wood--a community largely untouched by time and by the hectic pace and influences of modern life. Small wonder, then, that long-time residents of Wood consider it a little slice of heaven on earth. "Wood is the garden-spot of the world," says Bennie Gupton, an 88-year-old life-long resident of Wood. "Wood is a great place to live."